This week, trade ministers gathered in Hawaii to move the complex deal forward. 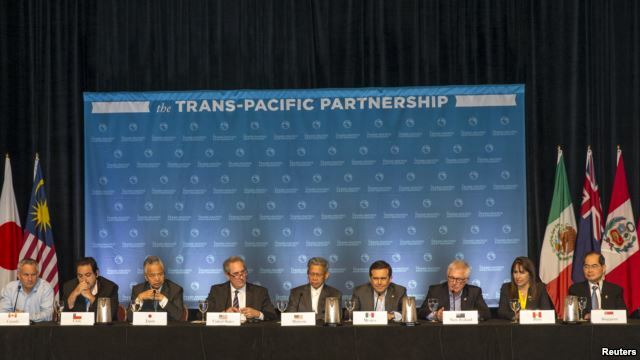 The TPP could cover 40 percent of the global economy. No date has been set for the next meeting on the agreement, but the trade ministers said work on resolving the problem areas will go forward. The issues are politically sensitive, including efforts to allow more imports of rice to Japan, more imports of sugar to the United States, greater access to Canada's dairy market, and expanding patent protection to a new class of promising drugs for 12 years. "The participating nations interests were at odds over the issue intellectual property and could not complete negotiations to come to a deal," Amari said in a separate news conference following the joint news conference a few hours before. He also said trade ministers shared a view that they will continue to make efforts toward an early agreement. "The participating nations share the belief that they will continue to work towards an agreement soon," Amari said, adding the next meeting could be by the end of the month. "I feel that with one more meeting of the ministers we will be able to come to a conclusion on the talks," he added. TPP supporters said this proposed pact would harmonize rules and laws between trading partners to make it easier to sell goods and services around the world. Attorney Tim Brightbill, who litigates trade cases, said a well-constructed deal would be a "big positive" for all the countries involved. But he warned that a deal that does too little to help U.S. manufacturing and jobs would not be approved by Congress. Other nations have other major goals, and their own approval process. A researcher who monitors Asian economic, trade and political issues said if officials cannot get a deal done now, they will "kick the can down the road," and keep working. Charles Morrison, president of the East-West Center in Hawaii, said there is a lot of political will behind the talks and "nobody wants the deal to fail." The TPP has sparked demonstrations in some TPP nations and is controversial in the United States. The U.S. Congress saw a related trade issue pass by a narrow margin after a major political squabble. Failure to seal the agreement is a setback for U.S. President Barack Obama. The pact is seen as the economic arm of the administration's pivot to Asia and an opportunity to balance out China's influence in the region.